So my article made the cover of Astronomy Magazine… | Where is Yvette? 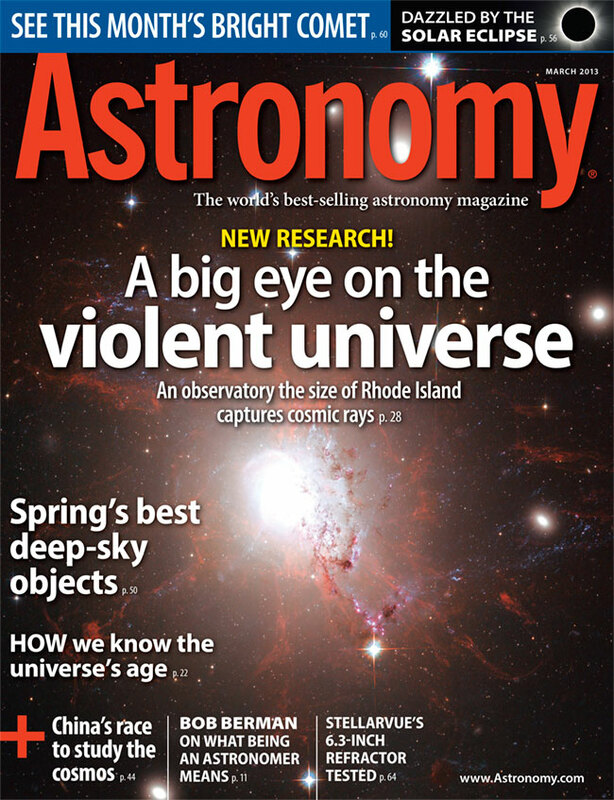 On the cover of Astronomy! Ok, forgive me, because unlike other teenagers who dreamed about being on the cover of the Rolling Stone I happened to dream about writing for Astronomy. So Almost Famous for geeks, but unlike most people my dream came true! One gets a touch philosophical when achieving such dreams, but I will refrain from sharing them all here except to say that I wonder if I’m a writer now. My conclusion is I think so, though certainly an astronomer first, so for now I will settle for being an astronomer-writer like a six-year-old who says she will be a rock star and the president and a pony. It’s just like then, who’s going to tell you no? Oh and of course, as you can all imagine from such a lovely cover the article inside is even better, so you should all go check it out in the March 2013 edition of Astronomy. The article is about cosmic rays and the Pierre Auger Observatory which I visited two years ago while working on my master’s thesis- a nice souvenir from that time of my life!- and seems to be nicely received on social media and the like. And hey, what kind of writer would I be if I didn’t encourage everyone I know to go and check it out?! Congratulations, Yvette!!! That’s quite an achievement! Rolling Stone is too easy 😉 Following your link to the March 2013 edition of Astronomy. Finally I got something interesting to read during my lunch! Yeay!! I like this website very much, Its a really nice berth to read and find info . “Never contend with a man who has nothing to lose.” by Baltasar Gracian. Pingback: In Which I Reveal I’m a Writer, Am Judged Insane | Where is Yvette?